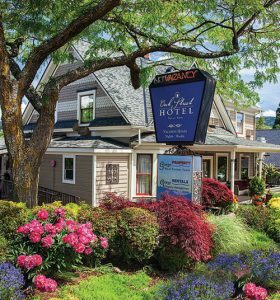 Located near Oregon’s highest peak, Mt. Hood, and within the lush waterfall corridor of the Columbia River Gorge National Scenic Area, Hood River offers magnificent hiking all year long. You’ll find short family-friendly walks, long cardio workouts, and everything in between. 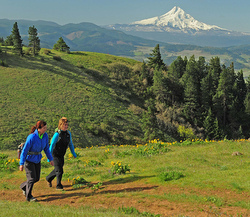 And, with the Pacific Crest Trail and other long-distance trail options nearby, multi-day excursions are easy to plan. A unique working landscape of public and private lands, the National Scenic Area is a world-renowned destination as well as a place that many people call home. Visit https://gorgefriends.org when planning your visit to the Gorge. 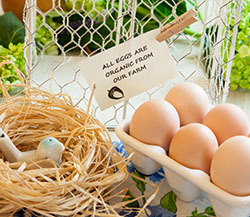 Expect to be Delighted by Our Special Farm to Table Breakfast! Pie for breakfast is our specialty. Pie made with a flaky crust that melts in your mouth with seasonal fruit from Hood River. Or, the pie might be quiche with fresh eggs from pastured chickens, Oregon cheese and a few surprises. Second helpings are encouraged. Our farm provides seasonal items to use in our breakfast selections such as berries, fruit, vegetables, flowers and herbs. Fresh fruit is locally sourced in the Gorge. Apples, apricots, cherries, nectarines, pears, peaches and plums are provided directly from the farmers who grow them. We use organic fruit when possible. Food items such as meat, milk, butter and spices are from outside sources. Whenever possible, these products are from the Pacific Northwest. Every effort is made to accommodate any dietary restrictions. 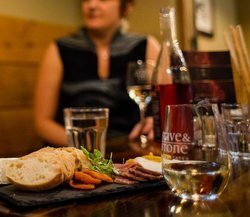 Ask us about our 2 for 1 local wine tasting vouchers at check in. We’re also happy to provide a map to all the wineries in the downtown area as well as a map of all local wineries.